KRISP Report: Major data analysis determines the trends of HIV-1 drug resistance mutations in South Africa. A recent paper published in PLoS One by Gert Van Zyl and colleagues (ref. 1) determines the trends of HIV-1 drug resistance mutations in patients failing antiretroviral therapy (ART). This paper also shows the effect of changing ART national guideline regimens since 2010, which replace Stavudine (d4T) based regimens for tenofovir (TDF) in adults and Abacavir (ABC) in children. In addition, it also analyzes one of the largest datasets of patients failing second-line ART in South Africa. There is much debate in South Africa on the effect of changing guidelines. This is because HIV-1 subtype C may be naturally more resistant to Tenofovir, due to the K65R mutation (ref. 2). 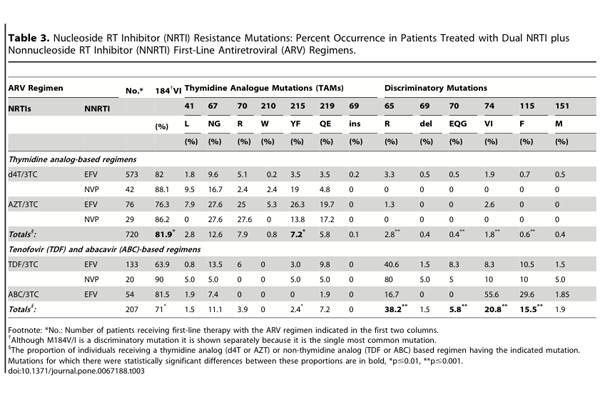 This study found that approximately 40% of patients receiving TDF had the K65R mutation. This paper has also analyzed 486 sequences from patients failing second-line ART, which includes Lopinavir/ritonavir (LPV/r). The analysis found that 11% prevalence of LPV/r resistance among patients with virological failure on an LPV/r containing regimen. These results are consistent with studies from the U.K. (ref. 3) and from South Africa (ref. 4). In addition, the development of low level Darunavir (DRV) resistance in about one-half of the patients with LPV/r resistance, suggests that DRV may be a valuable component of a third-line antiretroviral regimen. This paper produced one of the largest HIV-1 subtype C datasets. Very importantly, the 1,894 sequences produced were made available in the public domain. For example, the subtype C RT sequences from 1,398 first-line (i.e. NNRTI and NRTI-based regimens) treated patients represent nearly 40% of the 3,600 patients in the Stanford HIV drug resistance database (HIVDB). The subtype C PR sequences from 486 LPV/r-treated patients more than double the number of all subtype C-infected patients in HIVDB. This manuscript concludes that although TDF and ABC are more potent and less toxic HIV-1 inhibitors than d4T and AZT, the impact of their widespread introduction into South Africa requires ongoing monitoring to ensure that the efficacy of first-line therapy is not compromised. In addition, it concludes that resistance testing to identify optimal second- and third-line regimens. Importantly, in order to inform national and international policy makers, genotypic data and its associated treatment regimen should be made available in public databases (ref 5). 1 - Van Zyl GU, Liu TF, Claassen M, Engelbrecht S, de Oliveira T, Preiser W, Wood NT, Travers S, Shafer RW. Trends in Genotypic HIV-1 Antiretroviral Resistance between 2006 and 2012 in South African Patients Receiving First- and Second-Line Antiretroviral Treatment Regimens PLoS One,8(6):e67188 (2013). 2 - Lessells RJ, Katzenstein DK, de Oliveira T. Are subtype differences important in HIV drug resistance? Current Opinion Virology,2(5):636-43 (2012). 3 -Barber TJ, Harrison L, Asboe D, Williams I, Kirk S, et al. (2012) Frequency and patterns of protease gene resistance mutations in HIV-infected patients treated with lopinavir/ritonavir as their first protease inhibitor. J Antimicrob Che- mother 67: 995?1000. 4 - Wallis CL, Mellors JW, Venter WD, Sanne I, Stevens W (2011) Protease Inhibitor Resistance Is Uncommon in HIV-1 Subtype C Infected Patients on Failing Second-Line Lopinavir/r-Containing Antiretroviral Therapy in South Africa. AIDS Res Treat 2011: 769627. 5 - de Oliveira T, Shafer RW, Seebregts C (2010) Public database for HIV drug resistance in southern Africa. Nature 464: 673.